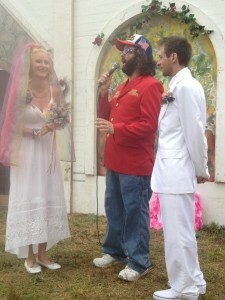 Last Sunday, June 10, 2012, my brother and his sweetheart were married by comedian and celebrity Judah Friedlander at the Bonnaroo music festival in Manchester, Tennessee. Jay and Sam had an adventure they will remember for the rest of their lives. A few days from now, on June 15, Allan and I will celebrate the 20th anniversary of our own little adventure. I love to tell my wedding story, probably more than people like to hear it. But on this landmark anniversary, it’s worth noting. 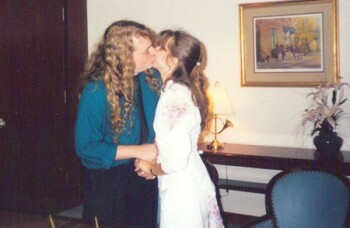 I was 22, and Allan was 25 when we got married. We’d been dating for 3 1/2 years, so why not? Seemed like the thing to do. At that age, 3+ years is a long time. We decided we’d elope while on vacation. 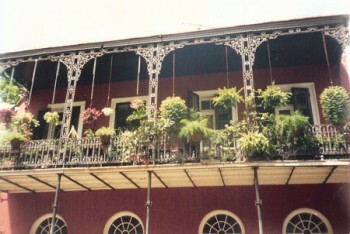 We liked to go to New Orleans every year, and we thought that would be the perfect place to elope. 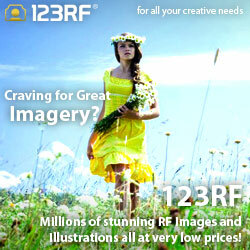 It would be cheaper than a formal wedding, and just as romantic. We wouldn’t tell anyone, except maybe our parents and closest friends. To everyone else, it would be a surprise. That was the plan, anyway. But then my mom called my grandma, who told the whole family. So much for that. A few weeks later, my grandpa died rather unexpectedly of heart failure. When our family gathered for the funeral, it was both a mourning and a celebration. Grandpa was the first death in our family, and I was the first grandkid to get married. It was the beginning of the big change that families eventually go through, and we all knew it. When it was time to say goodbye and drive back home, halfway across the state, my grandma grabbed my hand and held it so tight, my knuckles turned white. “Tie a double knot,” she said. The big day quickly came around. Our plan was to roll into New Orleans sometime on Friday before the government buildings closed, apply for our marriage license, get married on Saturday, then go celebrate out on the French Quarter that night. We drove all night, and got there early Friday afternoon, only to find a major Gran Prix race running through the streets of downtown New Orleans. What the hell? There were signs taped to all the doors, all government offices were closed till Monday. I sat on the courthouse steps and cried. Allan assured me it would be ok, and we could still get married. So we made the best of the situation. We got all dressed up in our tux and gown on Saturday night, headed down to the French Quarter, told everyone we were just married (how were they gonna know? ), and people bought us drinks all night long. A good time was had by all. We toasted with a couple who were celebrating their anniversary that night. We ate beignets, and looked at Saturn and the Moon through a telescope next to the Cafe du Monde. 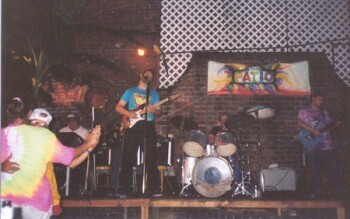 Allan sat in with a band at one of the clubs on Bourbon Street, and broke the poor guy’s guitar string. He played a tune with a couple street musicians, and a rich white tourist gave them a $10 tip. 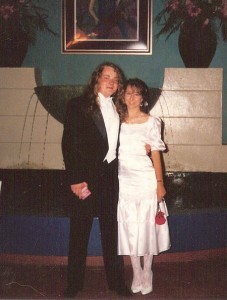 Seconds later, I spilled red strawberry daiquiri on the front of my white satin tailor-made wedding dress. An adventure to remember, indeed. Monday morning, we headed back downtown to do the deed. We spent way too many long, hot hours, shuffling from building to building to take care of all the paperwork (and it was not lost on us that the building with all the poor people was the only one without air conditioning). Eventually we found ourselves in the judge’s office. He was a well-fed guy, balding on top, and very judge-looking. He was very nice, but I wouldn’t want to face him on the stand. He was a native Cajun, he told us, and those were about the only words he spoke that we could understand. We did a lot of smiling and nodding. I think he was on about the Gran Prix race, and probably the heat. But he talked so fast, and his accent was so thick, it was hard to tell. After we were officially married, we wandered back down to the French Quarter to soak up the vibe of the city and have some more beignets and coffee. It was late afternoon, nearing sundown, and the sweltering heat had finally let up a little. We wandered into a little shop we loved to visit, called the Mystic Curio, on Royale Street. The shop’s proprietor was a very characteristic guy, a big pirate looking dude with a long, gray beard, tattoos on his arms, and a brightly colored parrot on his shoulder. He was standing behind the counter when we walked in. We told him we were just married, and talked with him about handfasting, an ancient pagan wedding ceremony. “Come on back,” he said, motioning for us to follow him. He grabbed a bottle of wine and a couple glasses, and led us back to the courtyard behind his shop. It was a tiny little patch of paradise, bursting with flora and fauna. Cascading ivy and flowers covered the walls of the courtyard, a concrete fountain tinkled with water, and there were animals everywhere. I remember peacocks, a bunch of cats, a couple dogs, maybe a goat, and the parrot on his shoulder. There we were, in another world – tucked between Bourbon and Royale streets, surrounded by thousands of noisy drunks and tourists on the outside. But here in the courtyard paradise, we couldn’t hear a sound but the chirping birds and tinkling water. Our handfasting was quick and impromptu, but romantic and beautiful all the same. He wrapped a ribbon around our hands and held them over a glass of wine. He gave us blessings, we drank from the wine, and he bound us in marriage under witness of a couple peacocks, a bunch of cats, and the parrot. He advised us to “drink wine together, and often.” We took his advice to heart, and we’ve made sure to follow it over the years. The next morning, I called my mom to tell her it was official. She talked to grandma and told her about the disruption in our plans. Grandma told her, “everything happens for a reason.” As it turned out, the day we ended up getting married – June 15 – would have been my grandparent’s wedding anniversary. Soon after, I was reflecting on the whole adventure. I kept thinking about my grandma’s words, “everything happens for a reason.” I thought about my grandpa and the love he was sending us from beyond. I was happy that mom had spoiled our surprise, and that the whole family knew we were getting married, especially grandpa before he died. Then I thought about grandma’s advice, and it occurred to me – something we hadn’t planned, or really even realized at the time – we’d tied a double knot. Here we are, twenty years later. Our amateur wedding photos are fading with age, and some of our family have never seen them. This was long before computers were a common household appliance. I’ve scanned a few of them and included them on the next page. You can stop here, or keep going if you want to see a few pictures. Thanks for listening! 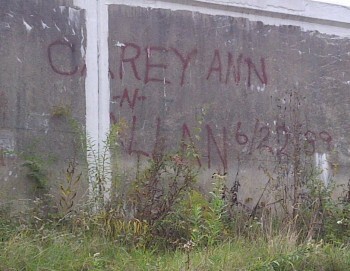 We’d only been dating a few months when Allan left our mark on a railroad bridge along the White River in Muncie. His graffiti is dated 6/22/1989. A friend of ours, Greg Zirkle, saw and snapped this photo while kayaking on the river in 2011. Coincidentally, June 22 was the date we wanted to get married. But we had to move our date up a week, thanks to the poor timing of Huntington’s Heritage Days Festival and my job as writer/photographer for the Huntington County TAB. 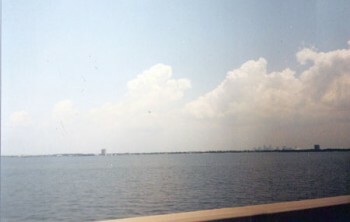 Coming into NOLA, crossing Lake Ponchartrain, with the city skyline on the horizon. On our way back home, we decided take a little detour to cross the lake the long way, just to say we did it. We did it. Not in a hurry to do it again. 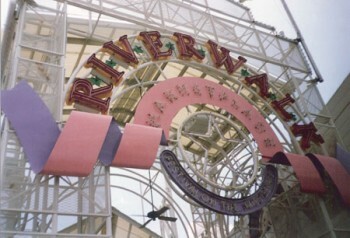 This place is probably long gone, but our hotel suite was at the Riverwalk, a sad attempt at a high-scale shopping mall with a nice hotel attached. This is, sadly, one of the best pictures I’ve got of the fabled wedding dress. I took it to the cleaners to have the strawberry daiquiri stains removed. Because it was such a tough stain job, the laundromat sent it out for special cleaning. Then it disappeared into the aether, never to be seen again. Does it look like my face is melting off? It was. This was June in NOLA. 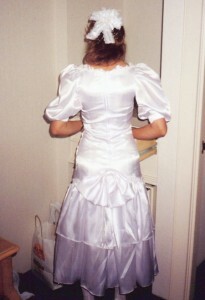 Here is the back side of the fabled wedding dress. 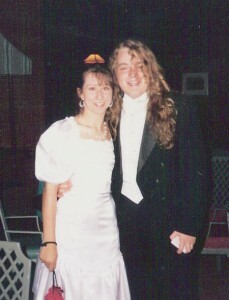 I didn’t pay too much for the dress, but I had it custom made by a seamstress in downtown Huntington. It was made of soft, white satin, with a big bow at the back. I wanted a fitted, tiered, tea length mermaid style dress. The finished product was close, but not totally what I had in mind. Otherwise I’d have been more upset the cleaners lost it. I do love those puffy sleeves (not!! ), they’re so ’80s! Except this was 1992. That’s what I get for having a dress made in Huntington. This was the closest we came to an official wedding picture, and the one we had printed in the local paper. It’s also about the only one where we don’t look too sweaty or hammered. We’re having a blast bar hopping on the French Quarter, but the pictures get blurrier as the night progresses. We had no trouble getting people to take our photo or buy us drinks. The couple dancing in the picture were sitting at the table next to ours. They were celebrating their wedding anniversary that night. At some point, Allan got up to play a song with the band. Reciting our vows in the judge’s office. Good thing I brought a backup wedding dress! Allan winked at me, and I started to giggle uncontrollably. I couldn’t stop giggling through the entire ceremony. I’m so thankful we didn’t do this in public! Unfortunately, there were no photos from the handfasting. The Mystic Curio still exists, but no longer in New Orleans.